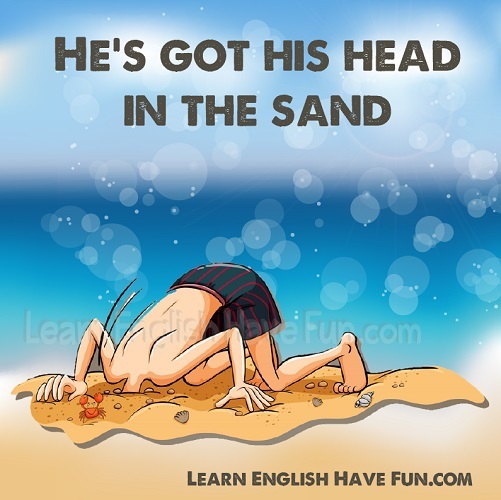 Look at the picture and try to guess the meaning of the idiom 'head in the sand.' Hmmm, what could this idiom possibly mean? (bury/have) one's head in the sand: to ignore or refuse to think about a problem or something unpleasant. The origin of this idiom comes from the incorrect belief that ostriches (a large bird with a long neck and large body) put their heads in the sand to hide from danger because they thought that if they couldn't see their attacker, their attacker couldn't see them either. It's a ridiculous idea and not true but we humans are also very dumb at times—especially when we try to pretend there isn't a problem when there is one. I knew I needed to finish my paper before exams started but I just kept my head in the sand and now I won't have time to finish it before its due. You've had your head in the sand about this marriage for two years and now I'm too tired to work on it. I want a divorce! Everyday he throws his bills in a drawer in his desk—he's got his head completely buried in the sand but soon his credit history will be ruined. Stop burying your head in the sand! Even if you don't tell your parents you're pregnant they're going to find out someday soon and then they'll really be mad! My neighbor is showing the same old head-in-the-sand behavior about his yard as last summer and the grass is now almost two feet high! You cannot keep your head buried in the sand for much longer—there isn't enough money in the account to pay our employees' salaries next month. Everyone had their head in the sand about Sandy's binge drinking until she came to church and passed out in front of the whole congregation. Here are three overdue bills! I can't believe you're burying your head in the sand again. Her ex-boyfriend blocked her on Facebook a month ago but she has her head buried in the sand and refuses to stop calling him. I developed a bad habit of burying my head in the sand regarding my finances and finally I had no choice but to file for bankruptcy. He's got his head in the sand and refuses to fire his secretary who stealing from him. 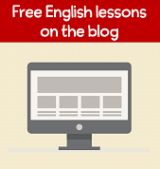 If you found this idiom useful, sign-up for my free newsletter to learn about new idioms I add to my site as well as other lessons and updates to my website. If you write a practice sentence it will help you to more easily remember this idiom in the future. Are you the type of person that keeps their head in the sand when there are problems? Do you have your head in the sand about something right now? What is it? Do you know someone who keeps their head in the sand? What are they avoiding?